Welcome to the Bensalem Education Foundation website! Looking for more information about one of the following? 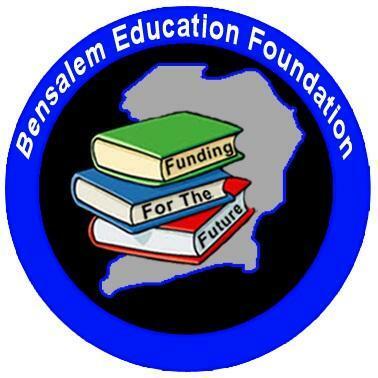 The Bensalem Education Foundation (BEF) is a group of community and school volunteers who work to get more resources to benefit students in the Bensalem Township School District. We are a federally-recognized public charity (501c3). We raise money for things the school needs that are not part of the budget. We provide an opportunity for teachers and administrators to apply for outside grants that require a non-profit entity as a sponsor, and because we are a non-profit, businesses and individuals can now donate to the school and get tax deductions for their donations. Find out more about ways to help BEF that will not cost you any more money than you are already spending. The First Mondays program (formerly First Fridays) is going well. For $50 for the year or $5 each month, teachers and staff can dress in their Bensalem Spirit gear on the first Monday that school is in session each month. Half of the funds raised in this program go into the Spirit account for the building in which they work and half are used for other BEF programming. Thank you to everyone who participates. Thank you to our 2018-2019 Building Reps! Thank you for volunteering your time to help the students of BTSD! Power Up! Program provides BEF with income when people choose Stream Energy! We are all looking for ways to support our favorite causes while still being conscious of family budgets. Bensalem Education Foundation has partnered with Stream Energy to assist our supporters in helping us by simply doing something they already do: pay their energy bill. Stream Energy's unique Power Up! Program helps raise funds by paying us monthly commissions when our supporters enroll for their electricity or natural gas service through Bensalem Education Foundation. The Power Up! Program is an excellent fundraising campaign for us because everybody uses energy already, and the commissions we receive are paid monthly for the duration of your relationship with Stream Energy. There’s no extra out-of-pocket cost for you, and we benefit on an ongoing basis every month. Still have questions? The PA Public Utility Commission (PUC) has tools to help consumers understand what it means to shop for electricity and how to shop. Visit papowerswitch.com to learn more! Support BEF while shopping on Amazon! Bensalem Education Foundation is a participant in the Amazon Smiles and Amazon Services LLC Associates Programs. Both provide an opportunity for BEF to raise funds when supporters shop on Amazon.com Please consider selecting the BEF as your Amazon Smiles organization of choice when shopping on Amazon. The website will be updated as needed, so that the Bensalem community can easily see what we are doing and how we are helping to make this a great place to be a kid!